Squid is one of the most common baits for saltwater fishing. Several varieties of frozen squid available at saltwater tackle shops. The most common is loligo (longfin) squid. Small frozen squid (calamari) is also available in grocery stores or seafood markets. When choosing squid for bait, quality can be important. 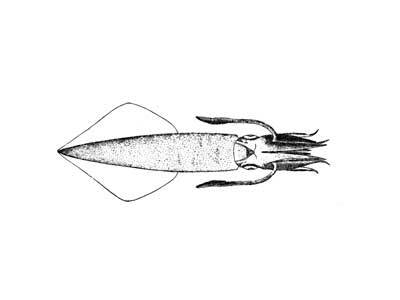 Small, thin-bodied squid do not hold up as well as large high quality product. Some tackle shops that specialize in top quality saltwater baits offer large pre-cleaned squid mantles or pre-cut strip baits. When preparing squid for bait, the skin should be removed and heads separated from the body as soon as possible. This minimizes discoloring of the meat from ink. After the skin is removed, squid bodies should be rinsed in clean saltwater, cut into strips, and kept cool. The size of squid strips is often related to the size of fish being targeted. Squid strips can be preserved for future use by freezing them in containers with a generous coating of kosher salt.